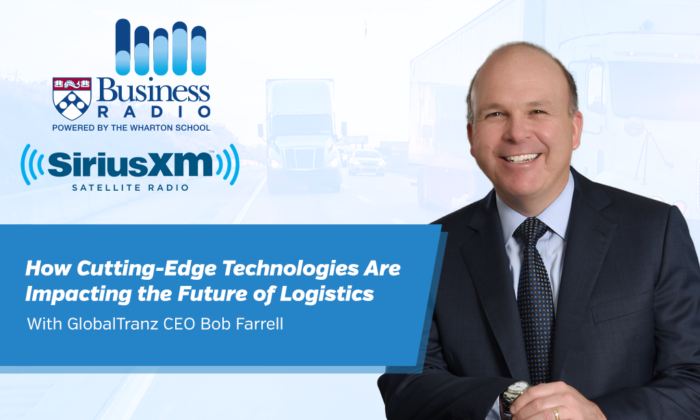 In a 25-minute interview with SiriusXM Business Radio, GlobalTranz CEO Bob Farrell shares how cutting-edge technologies and the ever-increasing sophistication of supply chains are profoundly influencing the future of logistics. On the program “Work of Tomorrow,” radio host Christian Terwiesch explores industry and technology trends with GlobalTranz’s CEO. How advances in artificial intelligence (AI), deep learning and predictive analytics are improving service and driving cost savings. How automating processes throughout supply chains are improving efficiency and decreasing labor costs. How B2C shipping and logistics best practices are impacting B2B logistics. How today’s logisticians must be part business analysts, data scientists, technology pros and big-picture planners. SiriusXM Business Radio powered by the Wharton School is an exclusive 24/7 channel featuring easily accessible information on a wide range of business topics. Business Radio airs on SiriusXM Channel 132, available through the SiriusXM Internet Radio App on smartphones and other connected devices, as well as online at siriusxm.com.